At the outset, the subject attempted here is complex and requires context, as it deals with interwoven topics of geo-politics, trade, energy-commerce, climate change, climate justice, diplomacy, ‘international export control regimes’ and multiple others to be precise! The aim is to simplify this broad subject and understand the recent efforts of Bharat in seeking the membership of the elite Nuclear club (Nuclear Suppliers Group, #NSG). It is important to understand the timeline and the sequence of events that unfolded in the past and how Bharat has now reached the strategic position into becoming the member state among the NSG states. (This write up draws heavily from various articles that have been published in the media in the past few days). In order to understand NSG (est.1974), first we need to understand the history of ‘NPT (est.1968-70) as a ‘pre-condition‘ to secure the nuclear energy reserves and become part of nuclear club among Developed nations. India has been hard-bargaining with respect to Climate Change agreements, as it affects the economic growth considering we as a ‘Developing’ state. Prime Minister Narendra Modi in his speech during the opening session of the World Climate Change Conference 2015 (COP21) in Paris, said,“Climate change is a major global challenge. But it is not of our making. It is the result of global warming that came from prosperity and progress of an industrial age powered by fossil fuel” – toughening his stand in the face of US criticism of India. The PM said, “But we in India face consequences. We see the risk to our farmers. We are concerned about rising oceans that threaten our 7,500 km of coastline and 1,300 islands. We worry about the glaciers that feed our rivers and nurture our civilisation. India’s progress is our destiny and right of our people. But we must also lead in combating climate change”. “We need a genuine global partnership. Democratic India must grow rapidly to meet energy needs of everyone”. In an article that the Prime Minister wrote for the Financial Times, Modi ji asked countries to “assume more responsibilities” and provide “affordable cleaner technologies” to the developing world. On August 6, 1945, the United States, with the consent of the United Kingdom (the Quebec Agreement) dropped a Uranium gun-type atomic bomb (nuclear weapon, Little Boy) on the cities of Hiroshima and Nagasaki of Japan, during the final stage of World War II. That was the most tragic event in the history of human race. On August 15, six days after the bombing of Nagasaki and the Soviet Union’s declaration of war, Japan announced its surrender to the Allies. On September 2, it signed the instrument of surrender, effectively ending World War II. The role of “bombings” in Japan’s surrender and their ethical justification are still debated. These events of history coupled with the ‘cold war’ era led to non-proliferation treaty (NPT). NPT’s objective is to prevent the spread of nuclear weapons and weapons technology, to promote cooperation in the peaceful uses of nuclear energy, and to further the goal of achieving nuclear disarmament and complete disarmament. The impetus behind the NPT was, with respect to the concern for the safety of a world with many nuclear weapon states. It was recognized that the cold war deterrent relationship between just the United States and Soviet Union was fragile. Having more nuclear-weapon states would reduce security for all, multiplying the risks of miscalculation, accidents, unauthorized use of weapons, or from escalation in tensions and nuclear conflict. In 1992, China and France acceded to the NPT, the last of the five nuclear powers recognized by the treaty to do so. In 1995 the treaty was extended indefinitely. After Brazil acceded to the NPT in 1998 the only remaining non-nuclear-weapons state which had not signed was Cuba, which joined NPT in 2002. The treaty recognizes five states as nuclear-weapon states: the United States, Russia, the United Kingdom, France, and China (also the five permanent members of the United Nations Security Council). Four other states are known or believed to possess nuclear weapons: India, Pakistan and North Korea have openly tested and declared that they possess nuclear weapons, while Israel (Policy of deliberate ambiguity) has had a policy of opacity regarding its nuclear weapons program. Opened for signature in 1968, the Treaty (NPT) entered into force in 1970. On 11 May 1995, the Treaty was extended indefinitely. More countries have adhered to the NPT than any other arms limitation and disarmament agreement, a testament to the Treaty’s significance. A total of 191 states have joined the Treaty, though North Korea, which acceded to the NPT in 1985 but never came into compliance, announced its withdrawal in 2003. Four UN member states have never joined the NPT: India, Israel, Pakistan and South Sudan. Fossil fuel disadvantages include pollution. When a fossil fuel material such as coal is burned to create energy, Carbon Dioxide (CO2) is released. This CO2 pollutes the atmosphere and contributes to the “greenhouse effect”. The history of fossil fuels is that these materials were created over millions of years from deposits made up of the remains of prehistoric plants, animals, and micro-organisms. Non fossil fuels, on the other hand, don’t rely on limited resources. Non–fossil fuels do not have this disadvantage. Non-fossil fuels are alternative sources of energy that do not rely on burning up limited supplies of coal, oil, or natural gas. Examples of these fuels include: Nuclear energy, wind or water generated energy, and solar power. These tend to be renewable energy sources, or means of generating power that can be utilized indefinitely. Proponents of nuclear energy contend that nuclear power is a sustainable energy source that reduces carbon emissions and increases energy security by decreasing dependence on imported energy sources. Proponents claim that nuclear power produces virtually no conventional air pollution, such as greenhouse gases and smog, in contrast to the chief viable alternative of fossil fuel. Opponents believe that nuclear power poses many threats to people and the environment. These threats include the problems of processing, transport and storage of radioactive nuclear waste, the risk of nuclear weapons proliferation and terrorism, as well as health risks and environmental damage from Uranium mining. 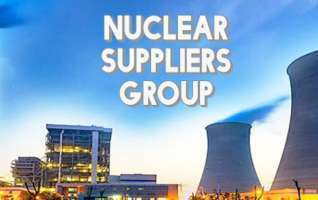 The Nuclear Suppliers Group (NSG) was founded in response to the Indian nuclear test in May 1974 and the group first met in November 1975 (Source). NSG is a group of nuclear supplier countries that seek to prevent nuclear proliferation by controlling the export of materials, equipment and technology that can be used to manufacture nuclear weapons. India has detonated nuclear devices, first in 1974 and again in 1998. India is estimated to have enough nuclear fissile material for more than 150 warheads. India was among the few countries to have a no first use policy moratorium, a pledge not to use nuclear weapons unless first attacked by an adversary using nuclear weapons, however India’s former NSA Shivshankar Menon signaled a significant shift from “no first use” to “no first use against non-nuclear weapon states” in a speech on the occasion of Golden Jubilee celebrations of the National Defence College in New Delhi on 21 October 2010, a doctrine Menon said reflected India’s “strategic culture, with its emphasis on minimal deterrence“. “Smiling Buddha” was the assigned code name for Pokhran-I of India’s first successful nuclear bomb test on 18th May 1974. The bomb was detonated on the army base, Pokhran Test Range (PTR) in Rajasthan. After the test, the Indian government declared that it did not intend to manufacture nuclear weapons – although it had the means to do so – but rather make India self-reliant in nuclear technology and harness nuclear energy for peaceful purposes. This was led by Prime Minister Atal Behari Vajpayee and Dr. A.P.J Abdul Kalam. On 11th and 13th May 1998, twenty-four years after Pokhran-I, the Indian Defence Research and Development Organisation (DRDO) and Atomic Energy Commission (AEC) conducted five further nuclear tests (Pokhran-II), code named as “Operation Shakti”. India has since declared a moratorium on testing. 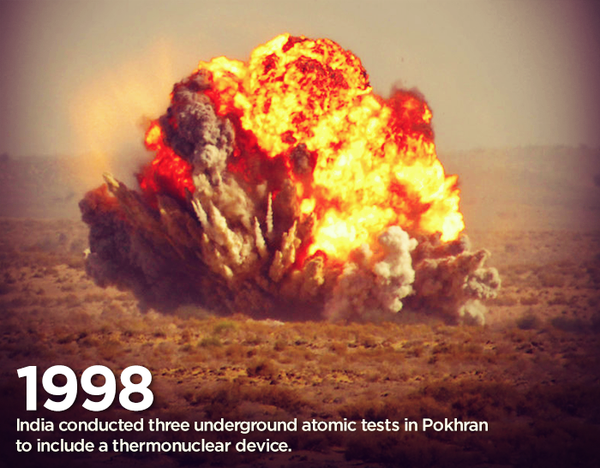 The Pokhran-II blasts in 1998 put India on the global strategic map. The sanctions were imposed. The then all-powerful West has dis-engaged India for a certain period, which could not last long. India was taken as a serious Nation just as China was always since 1978. India got tough in its negotiations and has grown in self-confidence. This is the ‘sine qua non’ for negotiating global economic deals (India was invited for engagements as it has become absolutely necessary for global partnership). In December 2006, United States Congress approved the “United States-India Peaceful Atomic Energy Cooperation Act, endorsing a deal that was forged during the then Prime Minister Manmohan Singh’s visit to the United States in July 2005 and cemented during President Bush’s visit to India earlier in 2006. The legislation allows for the transfer of civilian nuclear material to India. Despite its status outside the Nuclear Non-Proliferation Treaty, nuclear cooperation with India was permitted on the basis of its clean non-proliferation record, and India’s need for energy fueled by its rapid industrialization for a billion-plus population. The approval was based on a formal pledge by India stating that it would not share sensitive nuclear technology or material with others and would uphold its voluntary moratorium on testing nuclear weapons. The pledge was contained in a crucial statement issued during the NSG meeting by India outlining the country’s disarmament and nonproliferation policies. On 1 August 2008, IAEA approved the India Safeguards Agreement and on 6 September 2008, India was granted the “waiver” at the Nuclear Suppliers Group (NSG) meeting held in Vienna, Austria. The consensus was arrived after overcoming misgivings expressed by Austria, Ireland and New Zealand and is an unprecedented step in giving exemption to a country, which has not signed the NPT and the Comprehensive Test Ban Treaty (CTBT), while India could commence nuclear trade with other willing countries. The U.S. Congress approved this agreement and President Bush signed it on 8 October 2008. The 26th annual plenary session of the Nuclear Suppliers Group ended on Friday, 24th June 2016, without taking any decision on India’s application for NSG membership. 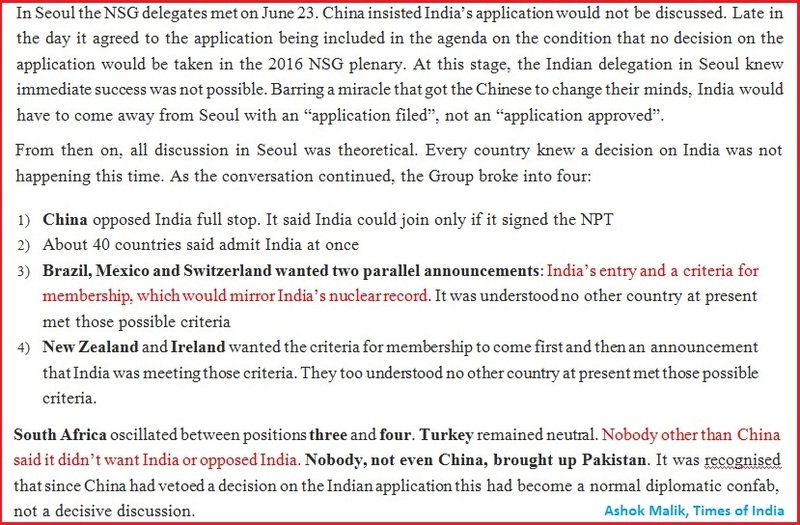 While the 48-member grouping held two lengthy closed-door sessions on the subject of new memberships, several countries expressed concerns over the entry of members who aren’t signatories to the Non-Proliferation Treaty (NPT), that India has refused to sign. Through the session, a team led by India’s Foreign Secretary S. Jaishankar monitored developments in Seoul, meeting with various countries to try and effect a favourable outcome. Suhasini Haidar, the foreign affairs columnist writes – “it was this sagacity that the Modi government seemed to be channeling as it carefully worked through speaking to members of the 48-nation nuclear club and tackled the issue of China, which seemed to be openly challenging India’s efforts”. The writings of Chinese strategist Sun Tzu (The Art of War) and India’s Chanakya (Arthashastra) hold several remarkable similarities, especially when it comes to their advice on war and diplomacy. Both spoke of the need for ‘strategy’ rather than ‘tactics’, for quiet diplomacy over the need to pick one’s battles carefully, and to fight them only when one is sure of winning. “The welfare of a state depends on an active foreign policy,” counselled Chanakya in the Arthashastra, “If the end can be achieved by not fighting, I would not advocate conflict.” In the same vein, said Sun Tzu, “To fight and win all your battles is not supreme excellence; supreme excellence consists of breaking the enemy’s resistance without fighting.” Diplomacy, both wise men would agree, not protracted dispute, is the order of the day. 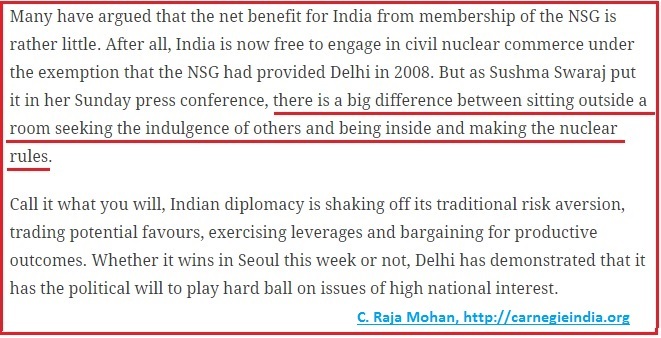 Undeterred by Chinese opposition in Seoul (2016), India has made it’s point loud and clear, urging for a special session for NSG countries to meet later this year, and consider India’s membership (before December 2016). 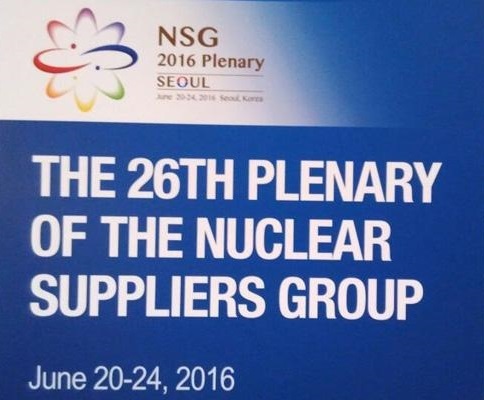 What happened at the Nuclear Suppliers Group (NSG) plenary in Seoul (June, 2016) ? There were deliberate attempts by both China as well as vested interests in Indian media, to confuse Indians back at home, to interpret and misinterpret the outcome from Seoul and on the proceedings within the four walls. First, the issues are complex and require context, which many may not have. Second, the political opposition to BJP is understandably using the occasion to target the Narendra Modi government and making partial assessments. Third, the Chinese propaganda mechanism has turned much more sophisticated in an intelligent and selective briefing of Indian media. This presents a challenge for India. 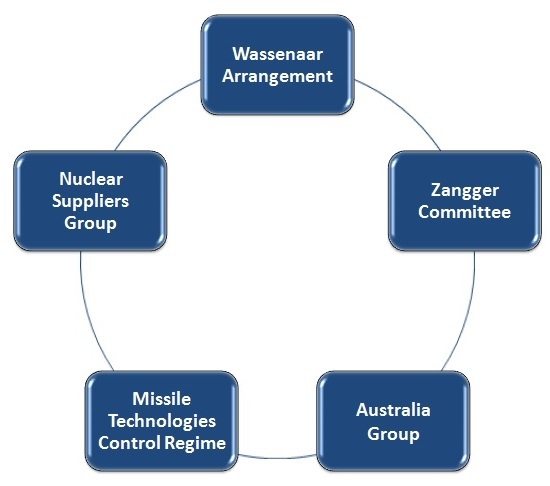 the Australia Group (chemical-biological weapons). If India was in the Group it could veto any change that would harm India, Teflon-coat the 2008 “waiver” and additionally contribute to the global nuclear regime. Astonishingly, the UPA government did not apply. It made a noise, but nothing more. Its nuclear liability law, which had problems that were eventually sorted out by the Modi government in 2015, may have deterred it. The liability law had made the 2008 waiver infructuous and nuclear commerce with India near impossible. India applied to the MTCR in 2015. After a setback it got in, on the second attempt, in 2016. In May 2016, it applied for NSG membership for the first time. By June most of the countries (about 40 of 48) were willing to take it in straightaway, no questions asked. This was a significant diplomatic achievement over two months. What next? The application is before the NSG. There is a renewed effort to have a special plenary decide on it in 2016 itself. That may or may not happen, but the NSG cannot defer the decision indefinitely. More critically, China has shown its hand. Unlike 2008 much of the diplomatic legwork was done by India, and not the US. In or Out of NSG, New Delhi’s Carried Out a Diplomatic Masterstroke, says Harsh V. Pant from http://www.thediplomat.com. (Harsh is professor of international relations in the Defence Studies Department and the India Institute at King’s College London. He is also an adjunct fellow with the Wadhwani Chair in U.S.-India Policy Studies at the Center for Strategic and International Studies, Washington, DC). Despite the sanctions in the past and the continued technology denials, India is marching ahead. Bharat as a democratic nation is at the cusp of becoming global leader with it’s strong political leadership, young demography and a robust economy. The strong diplomacy with hard bargains are necessary to keep up the momentum and cannot afford to simply sit back. Clean Energy: India is a growing nation whose need for energy is massive. India has set goal for itself about sourcing 40% of power from non- fossil sources. Now in order to fulfil this goal, Nuclear energy can play very important role as India now wants latest technology in this field and membership of NSG means access to all these technologies. Make–In–India: ‘Make in India’ is a stated objective of the Modi government and developing an efficient and secure nuclear-based manufacturing and research ecosystem will go a long way in establishing innovation in advanced technologies. NSG membership will allow for sharing and joint research in advanced technologies that can then be exported to other member states.The moment India gets a place in the NSG group, it is definitely going to help indigenous Indian companies which have always worked in isolation as every-time India conducts nuclear tests, it is slapped with international sanctions. Make in India will help in indigenization of nuclear technology from the various deals under which nuclear reactors are going to be built in India to be used in India as well as for selling to other countries. Once India enters into NSG, this initiative will be implemented better, creating not only employment but technology development as well. Getting State of Art Technology: The NSG membership will help India to gain access to technology for a range of uses from medicine to building nuclear power plants for India, which is essentially a nuclear ‘traders’ cartel. India has its own indigenously developed technology but to get its hands on state of the art technology that countries within the NSG possess, it has to become part of the group. India will have its say in matters concerning nuclear energy. Indian companies like L&T, Walchandnagar (experienced in making nuclear power plants), will find new markets overseas. Member nations will assist India in disposal of its nuclear wastes. It will also help India to make a stronger bid for UNSC seat. If the NSG was able to grant a “waiver” to India in 2008 on the basis of its past performance, it should have no objection to admitting the country as a member this time as well because of its clean track record in adhering to all its commitments. PM Modi’s address at Paris COP21 Plenary (30th Nov, 2015). 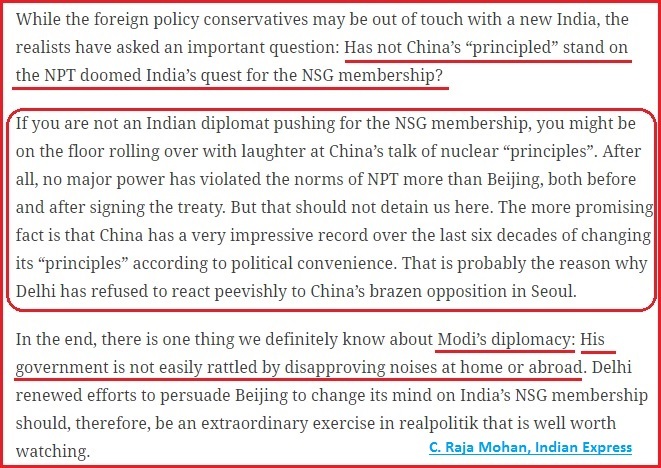 Could India have been an NSG member already? Nehru rejected US offer of help, says a new book authored by Maharajakrishna Rasgotra, who served as India’s Foreign Secretary under Indira Gandhi and Rajiv Gandhi and retired in 1990. “Kennedy’s hand-written letter was accompanied by a technical note from the chairman of the US Atomic Energy Commission, setting out the assistance his organisation would provide to Indian atomic scientists to detonate an American device from atop a tower in Rajasthan desert. 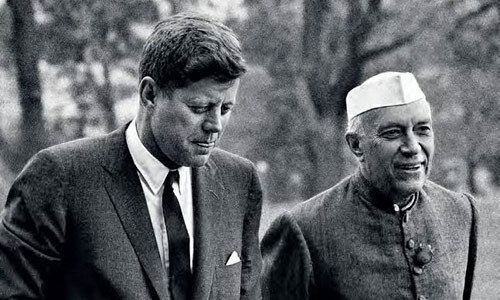 In the letter Kennedy had said that he and the American establishment were aware of Nehru’s strong views against nuclear tests and nuclear weapons, but emphasised the political and security threat China’s test would spell for Nehru’s government and India’s security. “Nothing is more important than national security”, Kennedy’s letter had emphasized. However, after discussions with Dr Homi Bhabha and G.P. Parthasarathy, Nehru finally turned down the letter, though he was not disinclined to the offer initially and had instructed Dr Bhabha to “work out a plan of action on most urgent basis, should we finally accept Kennedy’s offer”. The book tells the story of India’s foreign policy formulation from the initial years till towards almost the end of the 20th century. Interesting read from an editorial in China’s state-run “Global Times” on 28th June 2016. This entry was posted in Economics, General, History, Nation and tagged #NSG, 1998, 2008, 2016, Australia Group, Chanakya, CTBT, Defence, Diplomacy, IAEA, Modi, Narendra Modi, NPT, Nuclear, Nuclear Suppliers Group, Operation Shakti, Paris Agreement, Pokhran, Seoul, Smiling Buddha, Vajpayee, Vienna, waiver, Wassenaar Arrangement on July 1, 2016 by Swadhyaaya.